Wollaton Park, the extensive grounds of a stately home a couple of miles from Nottingham city centre. Now a public park famous for its herds of red and fallow deer and for fungi. When I visited earlier this month, the gate had a large red notice warning that it was the rutting season, so beware of the stags. I wandered round for some time, looking for deer and fungi, failing to see any of either. 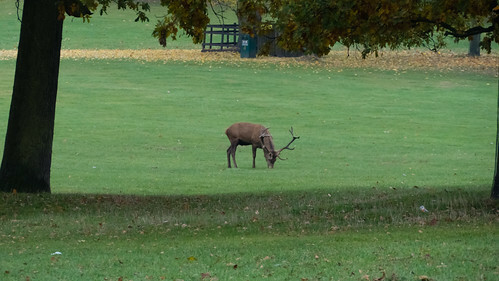 I had given up and was heading for a look at the Hall, when I came across this red deer stag.